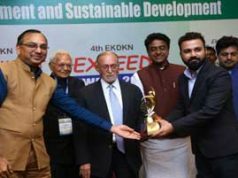 Joda: The Joda East Iron Mine (JEIM) and Khondbond Iron Mine (KIM) of Tata Steel received first and second prize respectively on Swachhata Pakhwada celebration on May 15, 2018 at a function organised at Barbil. JEIM received the award in A1 mines category and KIM was awarded in A2 mines category. 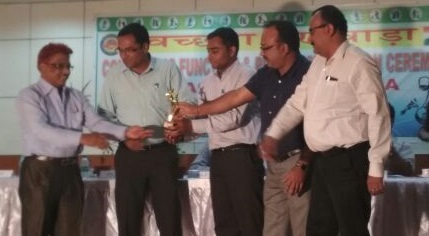 Similarly Joda West Iron & Manganese Mine and Bamebari Iron & Manganese Mine of Manganese Group of Mines received 1st and 3rd prize in Manganese Group- A during concluding function of Swachhta Pakhwada organised under aegis of DGMS, Chaibasa. On behalf of JEIM, Mr Debashis Jena, Chief Joda and Mr Shirish Shekhar, Chief Khondbond Project along with other colleagues of OMQ (Ore Mines & Quarries) Division of Tata Steel received the award from Mr Satish Kumar, Director of Mines Safety, Chaibasa Region. The fortnight-long Swachhata Pakhwada was kicked-off on May 1, 2018 which concluded on May 15, 2018. Under the aegis of Directorate General of Mines Safety, Chaibasa Region, 69 mines participated in the Swachhata Pakhwada celebration. These awards were given to JEIM and KIM after inspection in various parameters in terms of cleanliness and hygiene of shopfloors, workshops, plants and canteen premises, availability of drinking water and toilets in different areas and effective disposal of wastes etc. Tata Steel has been leading the cleanliness drive in and around the mining areas of Joda regularly through rallies, awareness sessions and celebrations.